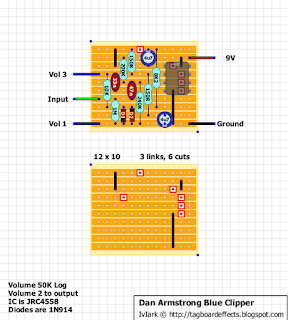 The Blue Clipper is an excellent fuzz-tone with incredible sustain. They're back! The legendary Dan Armstrong Sound Modifiers are now available again and they're better than ever. These units are now 100% USA made and are hand-built to authentic 1975 Dan Armstrong specifications by Grafton Electronics. Dan Armstrong Sound Modifiers are a range of simple, compact, and rugged accessories that can be used with any electrified instrument. They are designed to plug directly into the output of a guitar or bass guitar to give the player fingertip control of the sound, but they work just as well plugged into an electric keyboard or the output of any electronic accessory. Any musician, who wishes to use these units at the input of the amplifier, rather than at the instrument, need simply interchange two colour-coded wires inside the box. All six units are built in a heavy duty aluminium casing, using only the finest quality components available. Overall dimensions are 59mm wide x 59m high x 70mm deep (including plug). The unit only protrudes 43mm from the face of the guitar. Weight is only 41/2 ozs, including battery. Each unit has a specific effect or function, but several of them can easily be combined by plugging one into another to produce more complex effects. For recessed output jackplates (e.t.c Strat) adaptors are available to facilitate use. All units come complete with a 9 volt battery already fitted, so all you need to do is plug in and play! Unpleasant high-order harmonics are eliminated by a low-pass filter leaving only a full, rich, distorted sound. When the Blue Clipper is switched on, the instrument's volume control adjusts the amount of distortion. The output level of the distorted signal is adjusted internally to balance the fuzz loudness with the normal output of any instrument. The Clipper produces a super-stinging fuzz effect when combined with a Green Ringer. Input Impedance is 110 k Ohms. Output Impedance is 3 k Ohms, and the Signal-to-Noise ratio is 82db. Input and output ground legs connected together by a cable and also connected by the contact with the chassis (Non insulated jacks). I'm wondering if that could produce some problems in the stompobox. I always connect the input and output sockets to ground with a cable because if you get a poor mechanical contact, maybe a bit of grease on the box or something, then the socket(s) may only ground sporadically or not at all. That may be looking at the worse case scenario and it may be unlikely but it's a way of doing it that I'm used to now. I've never had a problem doing that so although it seems like you're creating a ground loop it's always been fine for me. Built it and it "works". 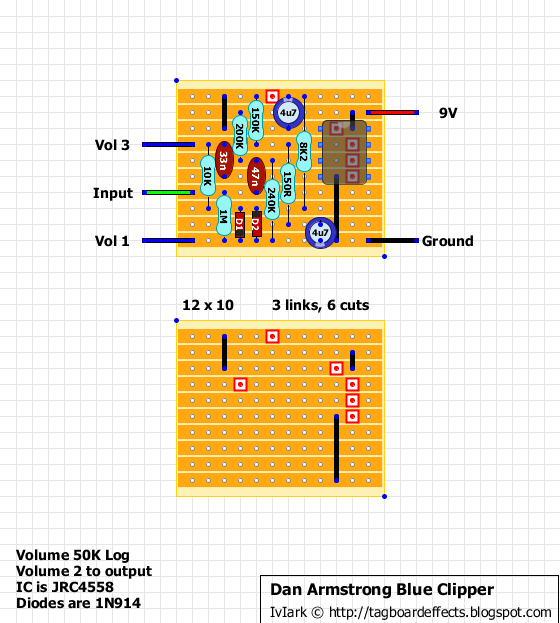 I did my own layout of this circuit some time ago (schem courtesy of FuzzCentral), and it "worked" the same way. As it was one of the first complete layouts i had done, i figured there must be something wrong with my layout. After all, i did add a power filter and pulldown resistor at the input. Hey, Mark, do you find a significant different between the 2n404 and the 2n404A, when using in effects? I have been trying to find a source on the web, to tell me whether the 2n404A's higher current makes a real impact on builds. I'm pretty sure mine are 2N404 and I've been really happy with them. Gain is perfect for fuzzes, I didn't test them all but the ones I did test ranged from 70 to 140 hfe (maybe just a couple a bit higher) but most were over 100. That makes them a great match with the Russian germaniums like the GT308B and similar which tend to measure from 50 to 90. Don't forget the Runoffgroove rundown on this circuit. Fun little sucker--I've built a couple for friends. Usually just throw in one LED on the clipping stage and this sucker really cooks. Mother of all unholy! Vince! This thing is insane! Came home from work and built up a Green Ringer board - then stuck it in front of the Blue Clipper... Sickest and best sounding octave fuzz ever. Play chords and it destroys the signal completely! 12th fret and up is siiiiiiick. What, in the same 1590A?? For obvious reasons, i omitted the pot and used a 100K trimmer on a 4x3 board. I tuned it a bit over unity. It's Green first on the right switch and Blue on the left. Great little box. And it's a keeper. Had sold my original (my first build ever btw) Ringer clone, so this will stay. You are clearly insane! I dislike it enough putting 1 small board in a 1590A! I'm a bit all over the place at the moment but I will try and get around to doing something like this. If you stick it in front of some other fuzz, let me know. I'm definitely interested how it turns out. Should try a few myself, as i can use ony the ringer side of that tiny box too. Yes, I'll probably make a ringer in it's own little box to begin with.. That way I can test it in front of various fuzzes. Did you measure the diodes? This is the only thing that I'm hesitant about as I'd just throw anything in there and I'm not sure how well it would work doing that. Have you tried the Foxx Tone Machine? I built that a while ago and I really liked the octave up on that too. On the Foxx Tone machine that is. About the ringer (i'll answer here one more time:)), i've built three and have sold the first two. First one was a kit from GGG and i don't think those were measured 1N4148s that came with it. The second i measured. Just used my DMM to find two 1N914s with closest possible forward voltage. Only difference was that the octave aspect of the modulation seemed a bit clearer with less off-note overtones. That board went to be add-on for OC-2 (layout from Sabro, truly massive board to build). Didn't measure the pair in this one, and i think that was the right desicion.. So. I'm fairly confident when i say that those do not need to be measured and matched. It'll work fine with whatever you throw in there. A ringer in front of a foxx... that would be interesting to hear ... octave up madness!! Built this yesterday into an enclosure with a DA Green Ringer. I must say I am having some fun with this one. Keep up the good work guys! I was really not enjoying the fizzy sound at quiescent, so I tried a number of things. I noticed that low current makes it oscillate, (click, click, click like a timer) so I added a 5k trim to the power supply to see if I could find a good middle ground between fizzy and clicky. Actually works pretty neat because if I want to, I can set it just right for a stutter fuzz. Anyhoo, with a trim on the power you can basically choose between 3 things: stutter, hum noise, or fizzy noise. So I swapped IC for TL072, but fizziness got louder. Swapped again for LM358, fizzy sound went away, the clipper sounded great, and even seems like it sustains longer, too. I am leaving the LM358 in there. I recommend you try it. Hey guys, just finished that thing and it sounds great, though i have a annoying high pitch whine in the signal wich can be heard when I am not playing, does anybody know how I can fix this? Is there a significant difference when compared to this one http://www.home-wrecker.com/newclipper.html? Frequency response differs. 33n is 3n3 in the "new". The two resistors for opamp input vref do not make that much audible difference. You could try out different values for the 33n and see what you like.